Ingredients: If you liked the plot of The Bone Collector, the mystery of From Hell, and the suspense of Copycat, then you will like this movie. The Raven is mostly a murder mystery with an interesting premise: what if Edgar Allen Poe had to stop the murders that he had written about? 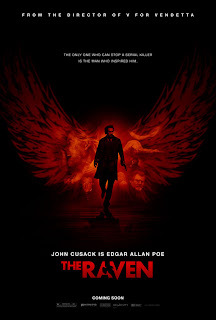 A rash of mysterious murders grip Baltimore, Maryland and Detective Fields (as played by Luke Evans) must try to uncover the connection that the murders have with the writings of Edgar Allen Poe (as played by John Cusack.) Detective Fields brings Poe in on the case as an advisor in hopes of deciphering the killers clues and stop the next murder but when Poe’s fiance is abducted by the killer, the two are in a race against time to save her from a grisly fate. Poe must dive deeply into his writings and his own psyche in order to stop this serial killer’s rampage. I really wanted to like The Raven, I really did. It started off strong with insights into the depression of Edgar Allen Poe, the ingenuity of Detective Fields, and the terror of the Poe-inspired killer. The director, Jame McTeigue, created a terrific 1800’s Baltimore and the colors and lighting really bring out the morbid nature of the movie. The dialogue is frightfully poetic and cultured, which really adds to the intensity of the conversations between characters. But then we hit the 30 minute mark and the film lost a lot of its charm. For such a strong start, the middle became sluggish and the ending was dull. I found myself getting bored. I should not feel bored during a murder mystery involving Edgar Allen Poe! All the imaginativeness seems to have run out with the first two murders. The rest of the time, Fields and Poe just go around finding dead bodies in less and less inventive ways. Alice Eve plays Poe’s fiance, Emily Hamilton, and while she was the most proactive damsel-in-distress I’ve seen in some time, she really doesn’t get any worthwhile development. And the scenes between her safely in Poe’s arms to her somehow already tied-up in the killer’s lair, gave me whiplash. It was handled so clumsily that I nearly tripped over the plot hole. The Edgar Allan Poe character is severally underused in his own film. It’s pretty obvious The Raven is a last ditch attempt to squeeze out the last bit of good press that’s been following the coattails of the Sherlock Holmes series, what with another period piece murder mystery with a famous name in literature. In fact, the Detective Fields character is the most interesting one in the film. It’s almost an inverse to the Sherlock/Watson relationship. While Poe is eccentric and imaginative, his over emotional displays and single-mindedness keep him from being any real help in the case. Fields, while being rigid and controlled, uses his smarts and solves the clues more then anyone else. So that’s The Raven in a nutshell, a movie with good intentions and creative concepts but poorly executed with a lack of suspense. Edgar Allen Poe becomes unnecessary in the story about Edgar Allen Poe. The murders that were described to be real-life recreations of those written by Poe never feel like their namesake. It’s very disappointing that the movie that had every excuse to dive deep into the macabre didn’t take the chance and instead went for mundane.